I recently got my yearly bonus from work. We're doing fine financially at the moment, so I wanted to go nuts and use a good chunk of the windfall to treat myself to a very, very nice card. Something BIG. Something I never would have even dreamt of owning as a kid. I thought it over for a while and it didn't take me long to find just the special item to put in my crosshairs. I ended up winning the auction for about triple the cost of my most expensive hobby purchase up to that point. I won't pussyfoot around it too much and admit it was just north of a grand. Some of you reading right now might think I'm insane. Fair enough. (I'm sure there will be a snarky comment or two in the comments.) Helping mitigate things were the fact I happened to get an eBay offer for 10% bonus eBay Bucks, and it seems most other folks didn't get the offer (but I hadn't gotten the previous similar offer I heard people talking about on Twitter a couple weeks prior), which means I was able to max that out to a $100 rebate to spend on eBay in the not too distant future. Plus just days before, I was approached by a buyer for my vast Rilo Kiley live/rare CDR/DVD collection (I had been meaning to find a home for them after backing it all up on external drives over the summer), so I had an extra $150 in my PayPal account, meaning when all's said and done, my 4-figure purchase will actually be more of an $800 hit. Also worth noting is that the same exact 1/1 card sold for nearly $200 more just a few weeks earlier. I think perhaps someone was trying to flip it, having bought it from a less prominent seller, then reselling it through Probstien123, which is probably the biggest sportscard consignment account on eBay. They're known for generally having max expected final bids (some folks even whisper rumors of shill bidding), but at least in this instance, it doesn't seem to have been the case, and the seller who consigned it looks to have taken a hit. And from other somewhat similar completed auctions, I feel good about the deal I got. I think the fact I was apparently one of the few who had the active Bonus Bucks offer at the time the auction ended helped give me an edge in bidding. Really feels like the stars aligned a bit for me this time! That was earlier last week. My big purchase was scheduled to arrive Friday, which added to the stress I mentioned in my last post, in addition to lots of work activity and the annual big work party Friday night. I had narrowly missed the mailman and would have to pick it up Saturday from the post office since a signature was required for delivery. So I put it out of mind and had a fun time at the party. I may have had too good for a time, though, and ended up getting violently ill that night after the Lyft home. That was rough! (I should have stuck to beer; it was the couple mixed drinks and especially a Maker's Mark "neat" at the end that really did me in.) Ended up sleeping on the bathroom floor much of the night. Then Saturday was pretty brutal. It ended up snowing decently overnight, so even if I had been feeling ok, I probably wouldn't have ventured out to the monthly card show. As it was, I was in a world of hurt with an epic hangover. My window for picking up the package was until 2 pm, and with work, I probably wouldn't have another shot until the following weekend (an eternity), so a little after 1 o'clock, I bundled up and took my dog for an arctic trek through the neighborhood to the post office. Lots of wind and snow in our faces, and remember I'm still feeling half-dead at this point. I figured it'd make memorable part of the story of how I got the crown jewel of my collection, at least! I successfully got the package and we returned home. Around 2:30, the sun came out and the snow started melting. It felt a little like, "oh great, now the weather improves." Or looking at it more optimistically, it was like the world signaling a victorious end to the journey. I held off opening the package until I wasn't feeling so crappy. Got plenty of sleep Saturday night and woke up feeling much better Sunday. 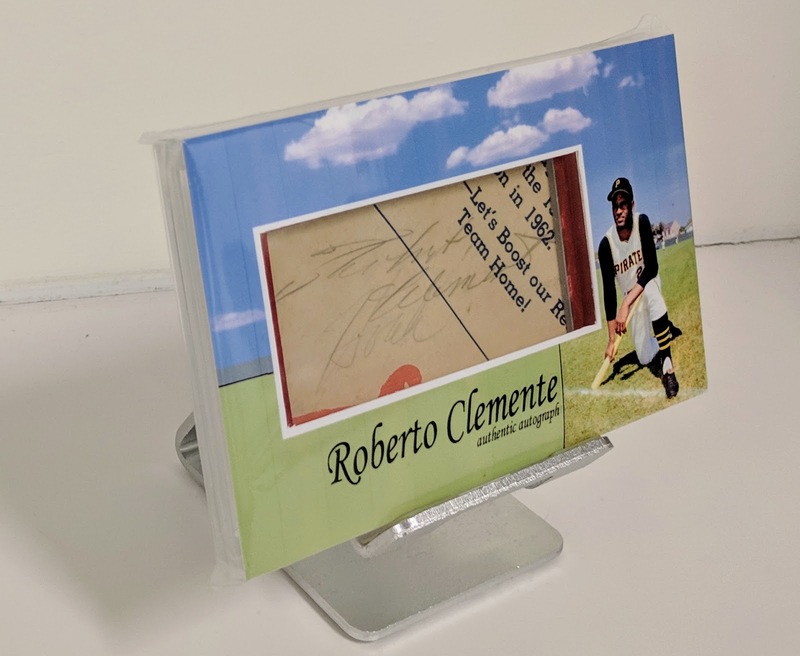 That's an authentic Roberto Clemente autograph. I'm still blown away that it's mine! I almost feel like I can retire from card collecting now. With the exception of like maybe a mint '52 Mantle or one of those mega-scarce Honus Wagner cards, I can't really think of a more impactful card for me.. nothing I'd personally put above a Roberto Clemente autograph. 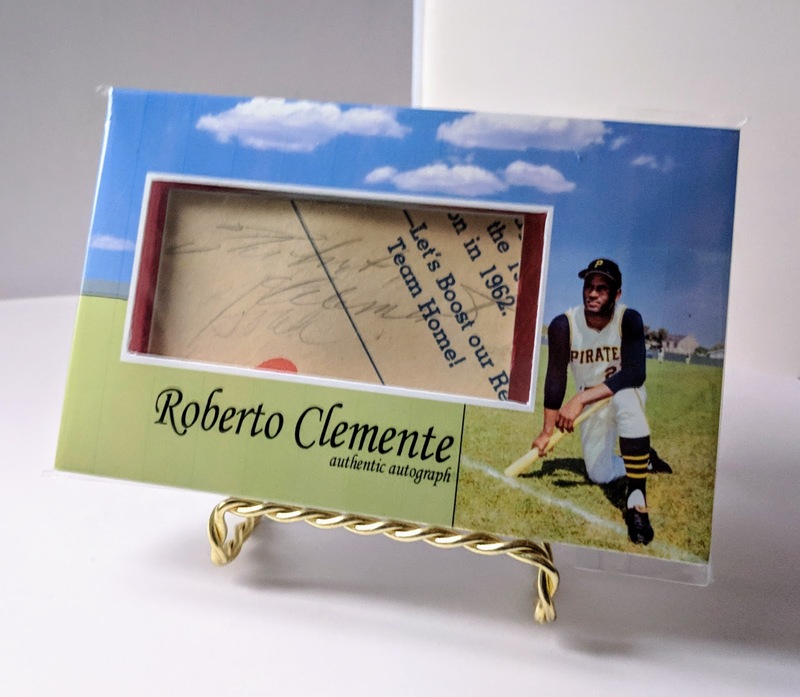 Obviously it's not perfect.. but then again, a perfect Roberto Clemente autograph would be much more expensive (and probably have a greater likelihood of being fake). I'm happy making due with an "ugly" one. Not to say there's zero chance this is fake, since I wasn't there when it was originally signed, but it has a lot going for it toward indicating it's legit, including how ugly it is. I have no plans to crack it out of its case, but of course I was going to make a custom overlay to spruce it up! Oh yeah, there's even a Willie Stargell cut auto on the back. 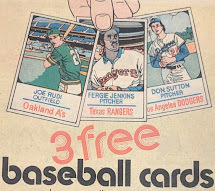 I love Pops, so that's a pretty cool, but I've already got 3 or 4 auto cards of his, as they're much more plentiful than Clemente, so it's a nice bonus, but definitely not the headliner here. 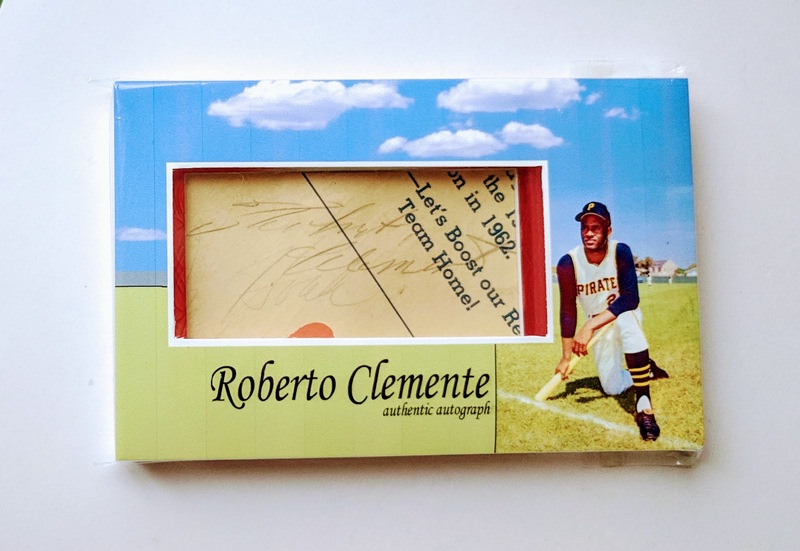 You may have noticed under Clemente's signature is another, lighter marking. Digging into it, turns out that's about 51% of Don Hoak's autograph, a very "tough" signature in its own right. He was the Pirates' starting third baseman for their 1960 World Championship team. He also got a ring with the '55 Brooklyn Dodgers. Sadly, he died in 1969 at the age of 41. The original document seems to be from 1962, some sort of marketing material to get Pirates fans excited to support their team. Perhaps it's from from a program or maybe an offseason event. Maybe it was from mid-season, alluding to a stretch run (They had a strong team that year, going 93–68, but that was only good for 4th place in the NL.) Further dating it to 1962 is that Don Hoak was traded from Pittsburgh to the Phillies in November of '62. If any Pirates fan could possibly track down a copy of this "Let's Boost our [...] Team Home!" document, I'd love to check it out in its uncut glory. Wrapping things up.. what else can I say? 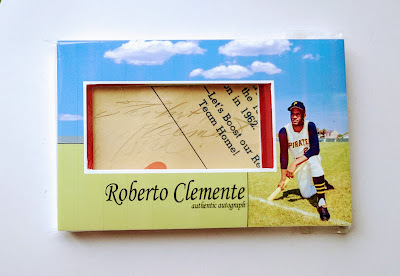 Never thought I'd one day own a Roberto Clemente autograph. Such an iconic figure, on and off the field. A great player and an even better human being. True hero. Legend! Hopefully this tiny remnant from his time on earth helps me in my life to be the best person I can. Ok, I'm laying it on pretty thick here and this has been a long rambling post, but you know what I mean. Bottom line is I'm incredibly blown away to have this in my collection. Incredible piece, congrats! I see nothing wrong with spending your money the way you see fit. And I have to say I love seeing a custom overlay for an encased card! That overlay is really cool. Nice way to display that card. 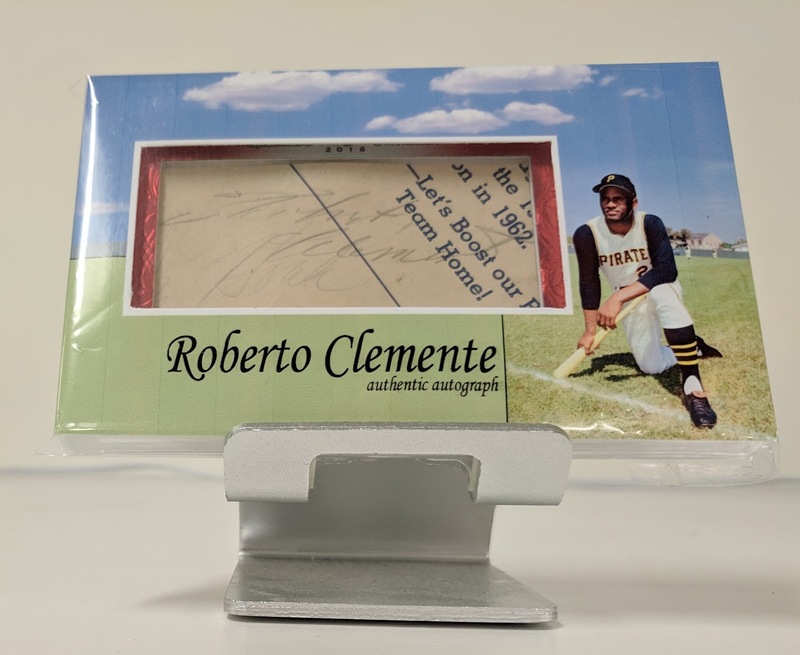 This is the first time I've ever seen a Clemente auto, pretty nifty! Somebody's gonna have to be a real a**hole to bust your balls for this purchase, I mean you obviously earned the money, so if you can afford it, why not? Who cares how YOU spent YOUR money, it's nobody's place to tell you what you should, or shouldn't buy. Thanks for saying how much it was too, a lot of times folks don't say how much their big ticket items cost, and I know that I can't be the only one who ends up being curious to know what they spent on whatever it was. Jon has this correct.... Gavin.... That's friggin a sweet acquisition!! Enjoy it. You earned it. Oh my Darlin, oh my Darlin, oh my Darlin Clemente auto. That’s awesome! Congrats on the pickup! I'll never understand the prices people charge/pay for signatures, but that said, glad you obtained what many think is unattainable. That's definitely a great feeling. Congratulations! I know a (very) little bit about him and I know he's somebody that anyone could definitely look up to. I don't think I could ever spend that much on a single card, even if I did have the money and position. 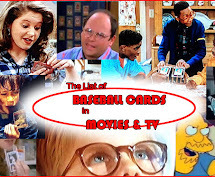 I had to be talked into buying a $20 card at the card show I went to a few weeks ago. Fantastic pickup. I wonder if you contacted Leaf they could provide more information on the document. Or maybe there's a Pittsburgh Pirates museum or historical society that could be helpful? Or the Baseball Hall of Fame museum? very cool! grew up watching Roberto back in the Forbes field days I was an autograph hound and he really didn't sign a bunch if you see a picture of Forbes there was a lot of space between the stands and the field of course some buddies of mine got his sig but not me so congrats from a life long Bucco fan ..and I wish 1973 cards moved like that one! Congratulations on getting such an amazing card! Congratulations! My philosophy is simple. Buy what you wanna buy. Collect what you wanna collect. As an autograph collector and fan of what kind of player/person Clemente was, I am totally envious of this card. And I love the overlay. Congrats!!!! 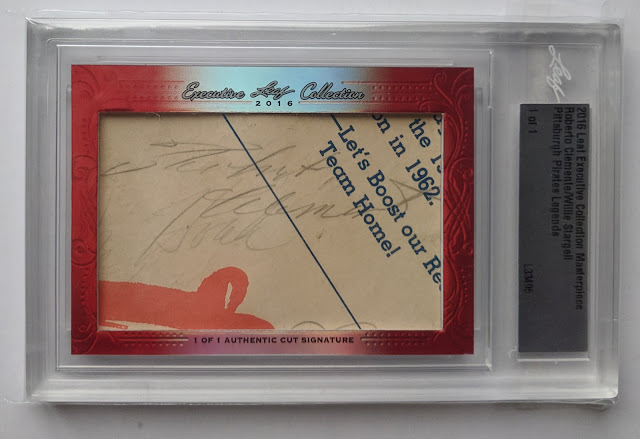 Two incredible signatures on one card. Wow! Congrats Gavin, I agree with what others have said. You only live once, you earned it, and you can't save it all. 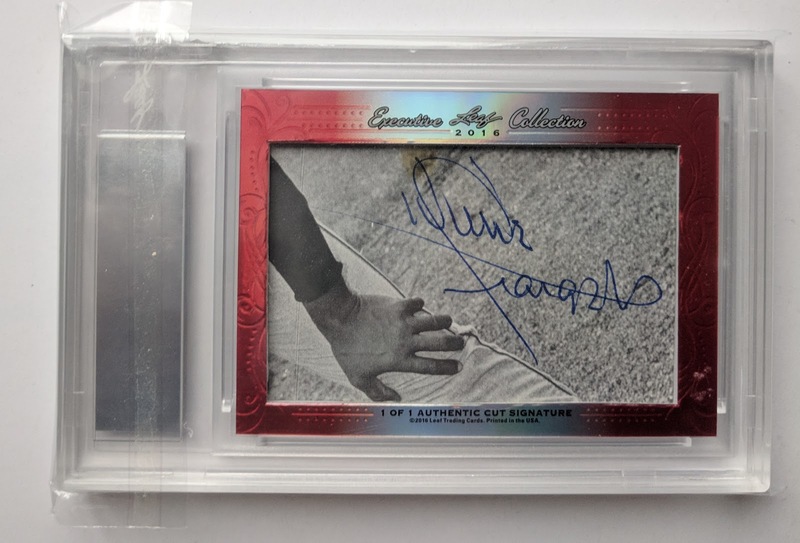 What an impressive autograph, truly a cornerstone piece to your collection. Holy hell that's cool. Congrats! Great card, and nice work on the overlay. Super jealous! Good use of the bonus check to get something like this. WOW!!!! That is awesome! Happy for you and your collection. Whoa. That's a gem for sure. I guess this would be your BONUS baby! Congrats!!! Nothing wrong with treating yourself! It's completely your business but thanks for sharing your joy with us, gav!